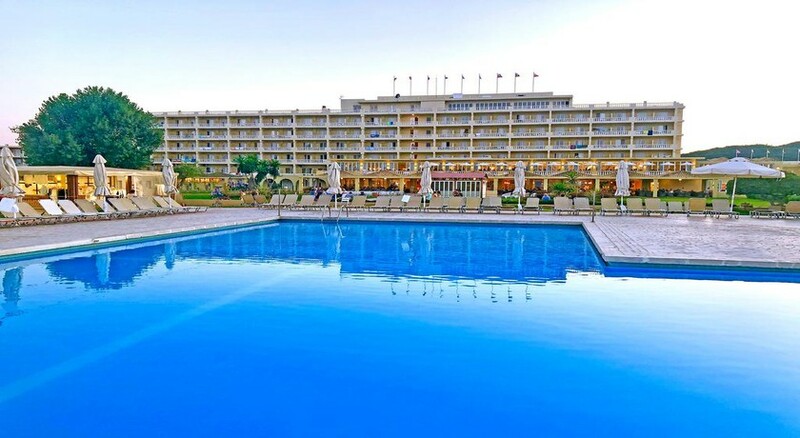 Messonghi Beach Holiday Resort is an all-inclusive family friendly 3-star beach resort on the east coast of Corfu Island on the Messonghi beach. The hotel is located in the vicinity of scenic villages of Moraitika and Messonghi. Take a refreshing dip at one of the two adult pools. The exquisite town of Corfu happens to be a UNESCO World Heritage site. The resort is nestled within landscaped gardens and on a scenic, safe beach on the Ionian Sea. Messonghi serves as an ideal destination for summer vacations for tourists from around the world. The Korission Lake and the Boukari harbor are within a short driving distance of the hotel. The scenic Messonghi Beach Holiday resort is located on the east coast of Corfu Island. The hotel is 19.3km from the Corfu airport. Tourists can either take a cab or bus to the resort from the airport. Pick-up can be arranged by the Resort on request. The Messonghi Beach Holiday Resort offers a variety of rooms. The hotel has been recently renovated to suit the tastes of modern tourists. The resort offers seven types of accommodation choices, all with tasteful furnishings and décor. The rooms come in the following variety: Beachfront Superior Bungalow, Superior Plus Twin Room, Superior Plus Family Room, Superior Twin Room (Twins, River Houses, Poseidon), Superior Family Room (Twins), Superior Family 2-Room and Comfort Family 2-Room. All the rooms are equipped with Wi-Fi, TV, air conditioning, among others and offer a sea-view or the garden-view. The rooms are maintained by the house-keeping staff on a daily basis. The Messonghi Beach Holiday Resort houses two spacious restaurants that offer breakfast, lunch and dinner. All meals are available in buffet style. The restaurants offer a variety of international and local cuisines which are freshly prepared. After a sunny-day on the beach, bars of Messonghi Beach Holiday Resort serve as an oasis. Beer, carafe wine, soft drinks or still water are served for free during the all-inclusive hours. Also, you can explore a number of bars in and around the Messonghi Beach Holiday Resort that offer cocktails and mocktails. The Messonghi Beach Holiday Resort houses two adult pools, 2 children’s pool and a mini aqua park with water slides for both children and adults. Access to the mini aqua park is free of cost and a nominal fee is charged for the water slides. A number of water sports including parasailing, banana boat-rides, water-ski, canoe and pedal boats and diving are available at an extra cost. To make the evenings memorable, the resort organizes events like Greek Nights, dancing nights and musical evenings with live bands for its guests. The resort also houses a spa and wellness centre, making the holiday a rejuvenating one for those who takes massages and therapies here. WiFi is available in public areas and costs EUR 1.70 per 24 hours. Nice facilities/pool for kids. Overall too noisy during the night / loud music from nearby night clubs. Basic rooms but clean. Hezky detsky bazen. Velmi hlucne hlavne v noci - hlasita hudba z nocnich klubu. Pokoje ciste ale pouze zaklad.